consolidates all right-click menus into a single resizable, movable, scrollable window. "Symmetry Lock" feature lets you control all parts within a symmetry group at once. Displayed values are obtained from the "primary" part. part highlighting so you know which part(s) you're affecting. With symmetrical parts, the primary one is highlighted in orange and the rest in yellow. works in both IVA and Map views. stock and blizzy78 toolbar support. I have current ships that would be entirely uncontrollable without this mod. Thanks for keeping it alive. Any plan on whipping up a quick .ckan entry? and I have others I need to fix as well. Will take a day or so to get them all done. All of my mods are done. Looks like a copy of better science labs continued 0.1.8 got sucked into the download for this, at least on spacedock. I refuse to use CKAN on principle, so I found this pretty easily. Side note: If anyone wonders why I don't use CKAN, it's because I've been modding KSP since 0.13.x and tweaking part config files since 0.15.x. 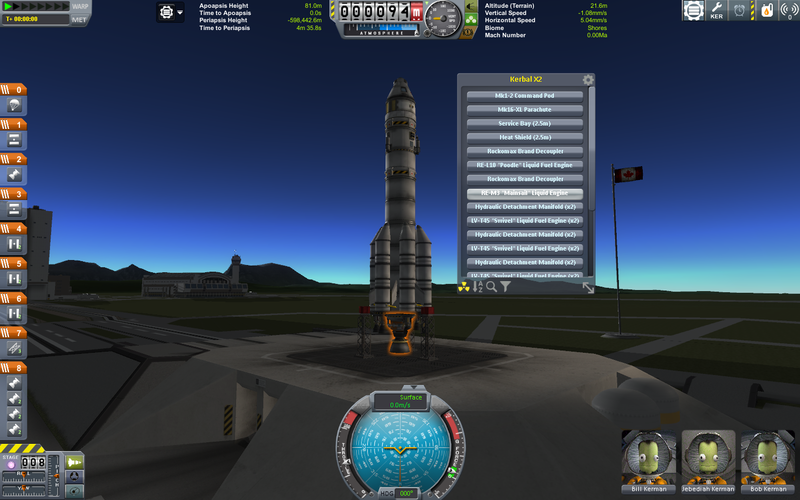 There were no mod managers specifically for KSP back then, so I learned to manually install mods. For me, managing mods isn't something I need to do very often, and with so many mods bundling Mini-AVC I can let it tell me that a mod has an update and check it out for myself. Thanks! This is one of the most usefull mod for KSP. Noticed a new version posted - curious about any changes. Thanks much - I've been a bit busy lately and completely missed the 1.2.1 patch. @linuxgurugamer Do you think it will be possible to add the "Aim camera" button to the available actions of the chosen part? Hello, I had a question about your Part Commander mod that I didn't see addressed. Is it possible to have the parts list also show while you are building crafts in the SPH or VAB? It would be handy for me to have a listing of the parts used to try and keep track of some of the parts that like to hide and never been seen again but cause RCS Build Aid drive you crazy trying to find them. I don't post often online and after trying KSP for Xbox One I decided I must get it for the PC due to the hardware limitations of the Xbox One. I see that you are active in quite a few mods for KSP and are still keeping them active, updated and adding new content. All your mods are great and top of the line, thanks for taking the time to create and share them for people like me and others to enjoy. thx for taking care of so many and espacially this great mod! I tried it and it works flawless. What I would like to know is if there's a possibility to show up the window even if i disable gui via F2? Maybe a CFG file or something? The background is I would like to play with no gui, no map and only iva. Well, and for parts its mostly no gui no control. So if the mod window wouldn't obey the F2 gui hide i could still control all parts via the mod "window popup" shortcut defined. I have a question regarding the filter and sorting of the partlist functionality. I wonder whether I just haven't found how to do it (the likely scenario), or it's not there. Is there any way to "save" the results of a part-list search, or to search the part list (I use Quick Search) and dump all results into a custom category? As you can probably imagine, you'd need complex-number-theory to describe the size of my parts-list (I'm the kid who'd build his own candy store ...). If I just got the dumb, don't spare my feelings when you let me know how. Thanks for taking the time to read all the way down here! No need to apologize, sir! For this, I've found another solution, my searches now run quick as heck and I can enter complete search terms in peace without having to fire up minesweeper to kill time.